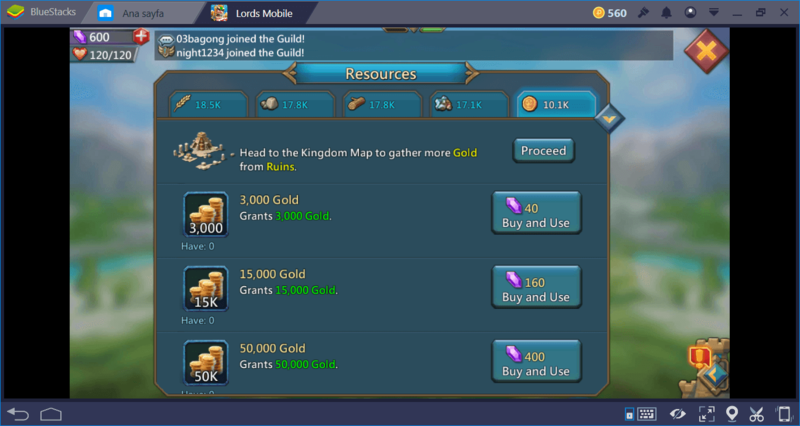 You need resources to do almost anything in Lords Mobile. Each action requires a specific amount of resources and knowing how to generate them efficiently is the key to success. This is the “real-time strategy” part of Lords Mobile: You need buildings to generate resources and keep upgrading them. However, you have a limited number of tiles to construct these buildings, so you should know what to focus on. In this guide, we will tell you how to do that. 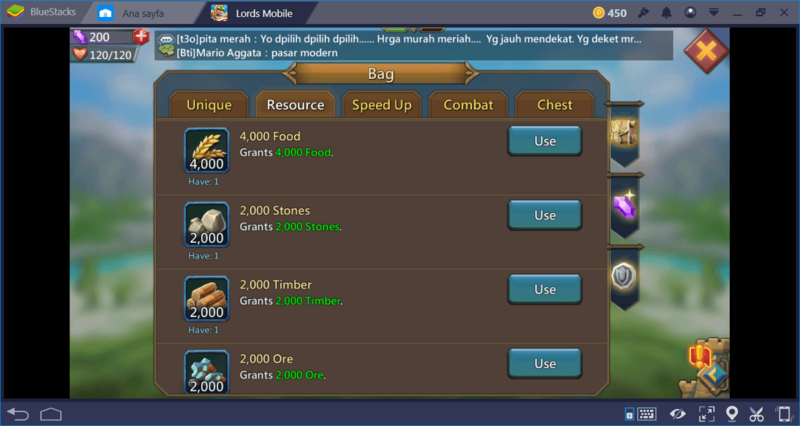 There are five types of resources in Lords Mobile: Food, Timber, Ore, Stone, and Gold. These are required to complete various in-game activities, such as research. Each activity costs a different amount of resources and this amount constantly rises. For example, a level 1 research may cost 100 Food, 100 Ore, and 100 Stone. The same research will cost 10.000 Food, 10.000 Ore, and 10.000 Stone at later levels. You should always keep a healthy amount of stock of resources as they are needed at every stage of the game. 1. Farms: Produces food. Can be upgraded to level 25. Food is used to sustain troops. 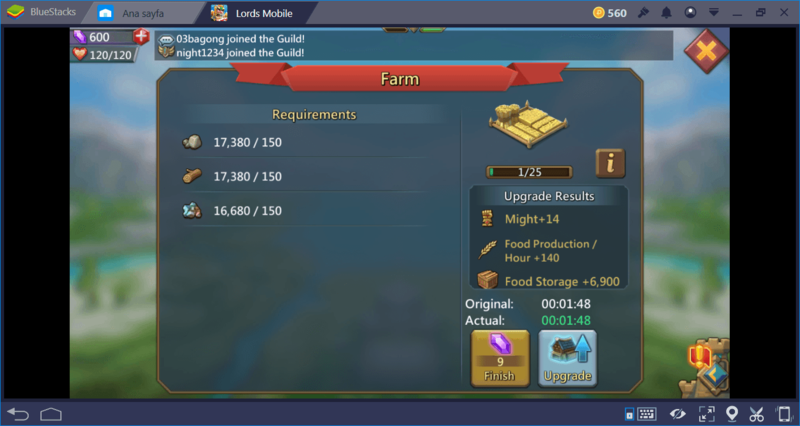 A level 1 farm requires 1 minute 12 seconds to build. Level 25 farms require nearly 48 hours to complete. 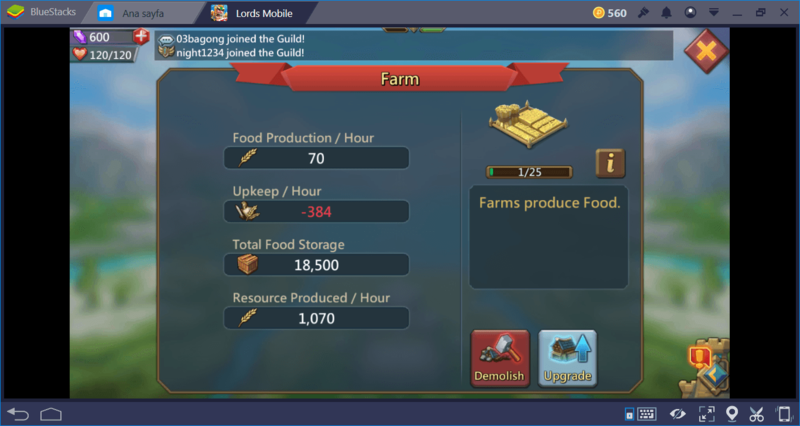 A fully upgraded farm can produce 38.210 food per hour. 2. Mines: Produces ore. Can be upgraded to level 25. Ore is used for lots of things, such as upgrading other buildings and research. There is a turf quest at the beginning of the game which asks you to build 10 mines. The reward is 120.000 ore. Finish this quest quickly to get the reward, and demolish the unused mines afterward. A level 1 mine requires 1 minute to build. Level 25 mines require nearly 2 weeks to complete. A fully upgraded mine can produce 22.940 ore per hour. 3. Lumber Mill: Produces timber. Can be upgraded to level 25. Timber is used for lots of things, such as training new troops. It also provides Might. Just like mines, there is a turf quest about them which rewards 120.000 timber. A level 1 lumber mill requires 1 minute to build. Level 25 mills require nearly a week to complete. A fully upgraded mill can produce 30.560 timber per hour. 4. Quarry: Produces stone. Can be upgraded to level 25. Stone is used mainly for upgrading other buildings. It also provides Might. Finish the turf quest like all other buildings to get 120.000 stone. A level 1 quarry requires 1 minute to build. Level 25 quarries require nearly a week to complete. A fully upgraded mill can produce 30.560 stone per hour. 5. Manor: Produces gold. Can be upgraded to level 25. Gold can be used to increase Barracks training speed. A level 1 manor requires 2 days to build. Level 25 manors require nearly a month to complete. A fully upgraded manor can produce 4.875 stone per hour. You can construct these buildings only on top of “tiles”. You can see them on your main game screen, they are in white-color and 22 in total. Each building has a storage capacity. Once this capacity is reached, there will be no new resource generation. To increase this quota, you need to keep upgrading these buildings. There are also talents you can use to increase the storage capacity and the speed of production. This is especially important at late-game: If you don’t upgrade these buildings, you won’t have enough resources even to complete a simple research. Producing thousands of resources per hour may seem impressive, but hundreds of millions of each resource is needed during the end-game for almost all activities. Never miss an upgrade opportunity and always aim to increase the storage limits of buildings. At early game: Construct 10 farms and 4 of each other buildings (manors excluded). You can keep this setup until level 20. Such a setup will provide you a healthy amount of each resource at the beginning. Sustaining troops is especially important at this stage, so we are focusing on farms. Food is the most used resource in Lords Mobile and you should aim for collecting as much as possible. You don’t need Manors during the early game, gold is not a “must have” resource at this stage. At middle game: After level 20, you should focus entirely on producing more food, up until level 25. This is because other resources can be obtained through gathering. This means you can click on an empty tile which contains resources and send your troops to collect that resource. In other words, buildings are not the only way to gather ore, timber, and stone at this stage. Since you focused on food production at early game, you have a big and healthy army now. Focus on increasing the size of your armies during the middle game. This means you need more food: You should aim for producing 2.5 million food per hour. You can achieve this goal by constructing 15 farms, 2 mines, 2 lumber mills, and 2 quarries. You should be already getting enough gold via quests, so there is still no need for a Manor. At end game: Once you reach level 25, demolish all farms. You do not need any more food. In fact, you have already reached the maximum storage capacity even if you have upgraded the farms. Food should come from your guild members and items at this stage. Focus on a pure ore/stone/timber setup during the end game. For example, 10 mines, 6 quarries, and 6 lumber mills should be a good setup. You should decide according to your needs at this point. Hope you found the guide useful. Let us know what you think! Good Luck with your game!